The Old Post Office01263 715779work01603 870304fax Self-cateringThe Old Post Office at Swanton Novers, which in part dates back to the 1860s, closed its doors to public service thirty years ago but has since been restored to an attractive countryside home. Set in delightful, mature gardens the cottage is spacious with separate sitting and dining rooms, a snug, a well laid out kitchen, laundry room and downstairs shower room. A wrought iron staircase leads from the sitting room to a mezzanine study/reading area and the first floor hosts two double bedrooms and a family bathroom. From this location North Norfolk is on the doorstep with most points accessible in less than an hour. The coastline offers nature reserves at Scolt Head and Blakeney, take a trip to watch the seals from Morston quay, discover the windmill and marshes at Cley-next-the-Sea or take the family to the wide, sandy beaches of Brancaster or Wells-next-the-Sea and sit on the sea wall with fish and chips! While away time in Burnham Market or Holt, both well known for their cafes, art galleries and restaurants or discover Norfolk's history through the great houses of Holkham Hall, Blicking or Felbrigg. Swanton Novers is the perfect starting point to look around the area and The Old Post Office could not be a more comfortable home to return to at the end of each day. 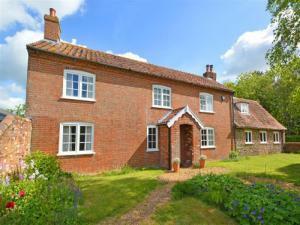 Exterior image of this attractive property located on the edge of this quiet village. The Old Post Office at Swanton Novers, which in part dates back to the 1860s, closed its doors to public service thirty years ago but has since been restored to an attractive countryside home. Set in delightful, mature gardens the cottage is spacious with separate sitting and dining rooms, a snug, a well laid out kitchen, laundry room and downstairs shower room. A wrought iron staircase leads from the sitting room to a mezzanine study/reading area and the first floor hosts two double bedrooms and a family bathroom.